A new resource guide is now available for residents of Fairfield County. The “Resource Guide for Women, Girls & Fairfield County Communities,” was collaboratively authored by Fairfield County’s Community Foundation’s Fund for Women & Girls, Franklin Street Works contemporary art space, and UConn-Stamford Women’s, Gender, and Sexuality Studies Program. There are approximately 1,000 copies of the publication in print as well as a digital PDF that can be shared via email or accessed on Franklin Street Works’ website. The public is invited to Franklin Street Works for a free, public launch party for the Resource Guide on Wednesday, February 27 from 6 – 7:30pm. The event will include short talks by Estefania Figueroa and Effie, who have benefited from support and services provided by The Ballet School of Stamford at Chelsea Piers, Stamford, and Triangle Community Center (TCC), Norwalk – two organizations listed in the guide. Attendees will also enjoy social time, a wine reception with light hors d’oeuvres, and are encouraged to pick up copies of the guide for personal or organizational use while there. 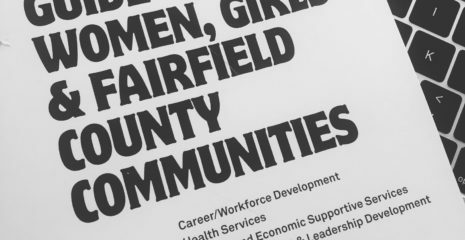 The “Resource Guide for Women, Girls & Fairfield County Communities,” includes 46 organizations with a special emphasis on four categories: Career/Workforce Development, Health Services, Housing and Economic Supportive Services, and STEAM Enrichment & Leadership Development. Funds for the guide were generously provided by Fairfield County’s Community Foundation’s Fund for Women & Girls with in-kind printing donated by Purdue Pharma. To request a hard copy or a digital PDF of the resource guide, please email your request to Info@franklinstreetworks.org. Effie is a 22 year old gender non-conforming person. They started as a volunteer at Triangle Community Center and other local LGBTQ organizations about two years ago. Since then they were awarded Volunteer of the Year at TCC in 2017 and were hired as their Young Adult Space Coordinator as of September 2018. Estefania Figueroa is a 9th grade student in the AP Science program at Westhill High School. She has been involved with the The Ballet School of Stamford since 2007. About Fairfield County’s Community Foundation’s Fund for Women & Girls: The Fund for Women & Girls, a special interest fund of Fairfield County’s Community Foundation, is the largest women’s fund in New England. Our mission is to engage philanthropists and invest in sustainable solutions that lead to economically secure and healthy women and girls throughout Fairfield County. Since 1998, The Fund has invested over $6.5 million in grants to programs serving females ages 5 to 90. The Fund is a member of the global Women’s Funding Network. Learn more about FCCF’s Fund for Women & Girls at fccfoundation.org/fwg and follow on Facebook and Twitter. About Women’s, Gender, & Sexuality Studies Program at UConn-Stamford: During the past fifty years, feminist scholarship on women, gender, and sexuality has been increasingly influential in reshaping the academic world. Women’s, gender, and sexuality studies scholars have opened up the canon in almost every field to new works, subjects and approaches which have stretched the boundaries of academic inquiry. The Women’s, Gender, & Sexuality Studies Program at UConn-Stamford gives students the opportunity to explore the role of gender, race, class, and sexuality in shaping ideas and social practices.